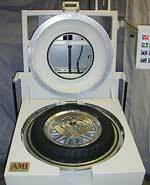 The Rim Gauger measures run-outs on wheels to maintain quality control during fabrication. It features a PC, data acquisition card, several LVDTs, a wheel fixture and custom software. While the wheel is spinning, LVDT output is captured and analyzed by the PC. At test end, the PC and custom software calculate various run-outs and compares data to pass/fail limits. A fully automated system, the Latch Valve Test System performs leak and flow tests on 44 types of latch valves which are used to control medical gases in hospitals. It features a rack-mount PC, a touch screen, an oval conveyor and four test stations. The first station verifies that the part under test meets its minimum flow specification while the next two stations check for pressure leaks. The final station removes failed parts from the conveyor and utilizes an ink stamp to imprint good parts. Software for this application was written in Labview. Sort station - removes the good primers from their tray and places them into an adjacent tray. 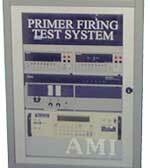 This tester performs leak and flow tests on oxygen pressure regulators at pressures up to 3,000 PSI. It consists of automatic pressure regulators, flow controllers, pressure transducers and a custom controller board to sequence the test operation and determine the test results. User defined RS232 input string format.